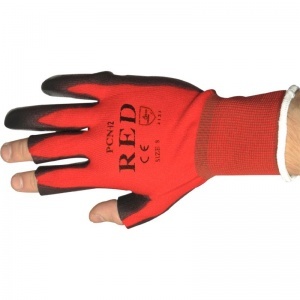 The Three Fingerless Red Handling Gloves PCN-12-Red are a 13 gauge, medium weight, machine knitted seamless construction of 100% nylon. 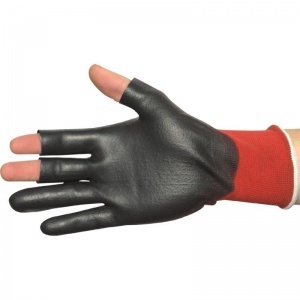 The Three Fingerless Red Handling Gloves PCN-12-Red provides superb dexterity for delicate handling due to the thin PU coating. 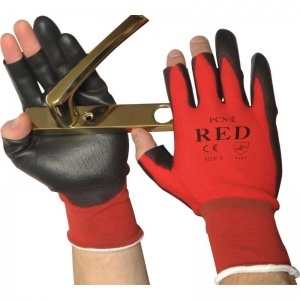 The thumb and first two fingers of the Three Fingerless Red Handling Gloves PCN-12-Red are exposed to allow for extra dexterity. 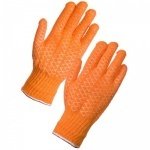 Treated with Sanitized hygiene function to promote freshness, hygiene and odour prevention. 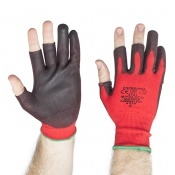 The product code for these gloves is PCN-12-Red. 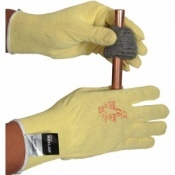 They are also available for purchase in case quantity.